Flowers RHS Award of Garden Merit. Bred by Charles Noble in 1876, it is a hybrid between C. x jackmanii and C. patens. The deep purple flowers (do not easily fade in the sun) are 15cm (6in) with silver on the reverse and reddish-purple stamens. Attractive wispy seed heads after the flowers fade. to go and buy online. Share with us your gardening experience! Copyright 2000-11 GardenAction. All rights reserved. GardenAction recommend CROCUS as your online supplier of Clematis. We have personally tested many online gardening suppliers and have found out from personal experience that CROCUS offer excellent value for money, reliability and security. When you visit the CROCUS site for Clematis, enter 'clematis' in their search box (shown as 'or find me info on'). 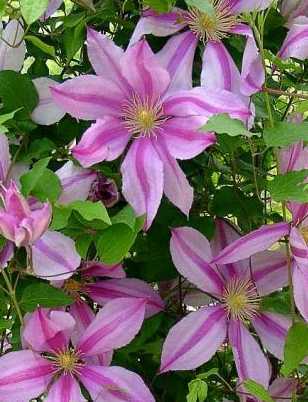 Good luck with your new Clematis!